The story may be apocryphal but is so indicative of writer-director Michael Mann’s legendary control-freakery that it bears repeating: While shooting one of this movie’s epic frontier scenes around pre-American Revolution Fort Henry, the exasperated Mann reached the end of his patience with an incessantly glaring orange light that no one on the set would turn off—until he was informed that the light in question was the rising sun. By all accounts Mann is the two-fisted sort who expects the sun to do as it’s told like any other cast or crew member, particularly while shooting the picture by which Mann would stake his claim to being the 1990s’ best American filmmaker. The irony is that the adaptation of James Fenimore Cooper’s novel about a white man raised by the Mohican tribe is Mann’s most aberrational work among the hard-boiled likes of The Insider, Thief, Collateral, Public Enemies, and Heat (Essential Movie Library #26). So maybe the ecstasy that seems to infuse every frame of The Last of the Mohicans—from the thinking person’s hot couple Daniel Day-Lewis and Madeleine Stowe to one of cinema’s last great original scores (a hodgepodge, until it got to the screen, by revolving-door composers Trevor Jones and Randy Edelman)—was born of creative liberation from the strictures of a modern-day crime genre that Mann has mastered all too well. 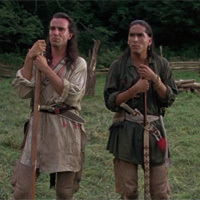 Mohicans is at its most daring when the most powerful moment of redemptive heroism is given not to Day-Lewis’s Hawkeye but the guy you’ve loathed the previous 90 minutes. If Mann didn’t write that scene, he should have, in collaboration with the sun.